Have you made your clinical paper accessible yet? Are Vidaza and Azacitidine the same drug? Why does it have two names? Azacitidine is the official generic and non-proprietary name given to the drug active ingredient while Vidaza is its trade name. The drug is widely available in the UK for the treatment of MDS since its approval in February 2011 by NICE - the National Institute for Health and Clinical Excellence (NICE). MDS UK Patient Support Group was in consultation with NICE during the approval process and campaigned for the approval of drug. Is Azacitidine (Vidaza) a chemotherapy? Azacitidine is a chemotherapy drug, however, it is a "hypomethylating agent". Hypomethylating agents are considered a non-intensive treatment. They are aimed at slowing the progression of the disease with as few side effects as possible, maintaining a good quality of life. They will not cure MDS but may ‘modify’ it. Azacitidine works at the DNA level, "switching on" genes that stop the cancer cells growing and dividing. This reduces the number of abnormal blood cells and helps to control cell growth. It is recommended as a treatment option for adults who are not eligible for stem cell transplantation and have intermediate-2 and high-risk myelodysplastic syndromes according to the International Prognostic Scoring System (IPSS) (See more at Nice Website). You have azacitidine as an injection just under your skin (subcutaneously) given by a doctor or nurse. This can be in your upper arm, leg, buttock or stomach. You usually have it as an outpatient but there have been successful experiences with home administration. You will have azacitidine as a course of several cycles of treatment. You can a treatment each day for a week and then 3 weeks with no treatment. This makes up a treatment cycle. You normally have at least 6 cycles and the treatment continues for as long as it is working. You can also have it every day, for 5 days. Then have 2 days off and have azacitidine again for 2 days at the start of the next week. "I hope and trust that my little story could encourage other MDS sufferers to decide to go through with the treatment"
Azacitidine is an important drug for the treatment of MDS but not all patients will respond to the treatment. Some will progress to leukaemia, others won't have an adequate response in terms of their blood count. 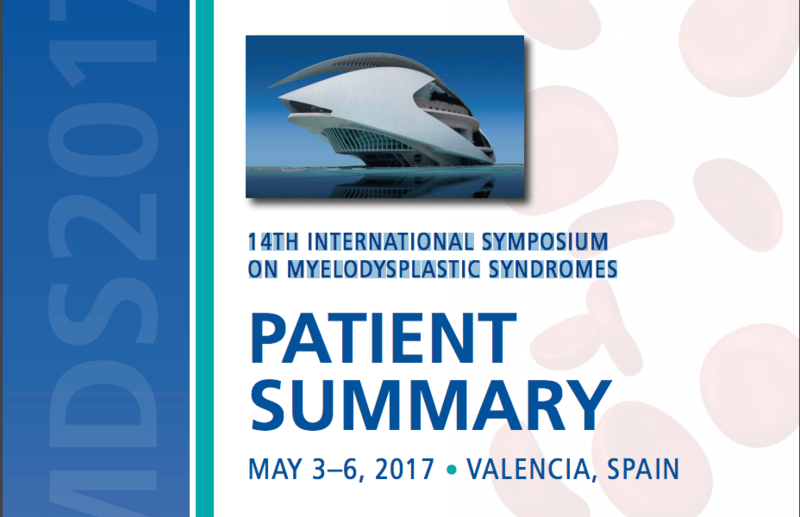 At the 14TH INTERNATIONAL SYMPOSIUM ON MYELODYSPLASTIC SYNDROMES, that took place in Valencia in May 2017, one of the topics discussed was the latest research around this important drug. Read more about how researchers are trying to establish which patients will have a good outcome with Azacitidine and whether the use of Azacitidine together with other drugs can make the treatment more effective. Researchers are exploring which factors might be useful for predicting a good outcome in patients with MDS. Certain treatment decisions for patients with MDS are based on cytogenetics, i.e. the study of the chromosomes. Azacitidine is appropriate for patients with higher risk MDS who often have mutations in chromosome 7 or three or more abnormalities in their chromosomes. 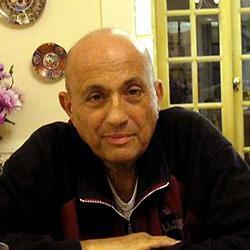 Dr. Raphael Itzykson, Université Paris Diderot, France, presented a study showing that if the platelet count after one cycle of the drug doubles, this is a good sign for an overall success of the treatment. However this happens in only a small proportion of patients. Several ongoing efforts, including the HARMONY study, have a good chance of identifying more factors that predict azacitidine outcomes in MDS and other blood cancers and of predicting the effects of treatment on the patient's quality of life, healthcare costs, and care strategies. Dr. Mikkael Sekeres (Cleveland Clinic, Ohio) focused his presentation on combinations of Azacitidine and other drugs for higher-risk MDS. The combination of Azacitidine and vorinostat seemed promising. In a phase II clinical trial, about 70% of patients with untreated higher-risk MDS, CMML, or AML responded to the treatment, which was about double the expected rate for azacitidine alone. These responses lasted an average of 16 months. Similarly, response rates and duration of response were promising in a phase I-II clinical trial of the combination of lenalidomide and azacitidine for higher-risk MDS. Dr. Fenaux added that studies are also evaluating combinations of Azacitidine with other treatments, such as valproic acid, venetoclax, immune checkpoint inhibitors, and idarubicin for higher-risk MDS or CMML. Other research is assessing more intensive hypomethylating treatments or lower doses for longer use. Studies are testing different drugs, including venetoclax, cenersen, and a 10-day decitabine cycle (another hypomethylating agent) for MDS with TP53 mutations. hints at better and more long-lasting responses for combination treatments if patients stay on them long enough. The hypomethylating drug “partners” under investigation might become options for higher-risk MDS in some patients.